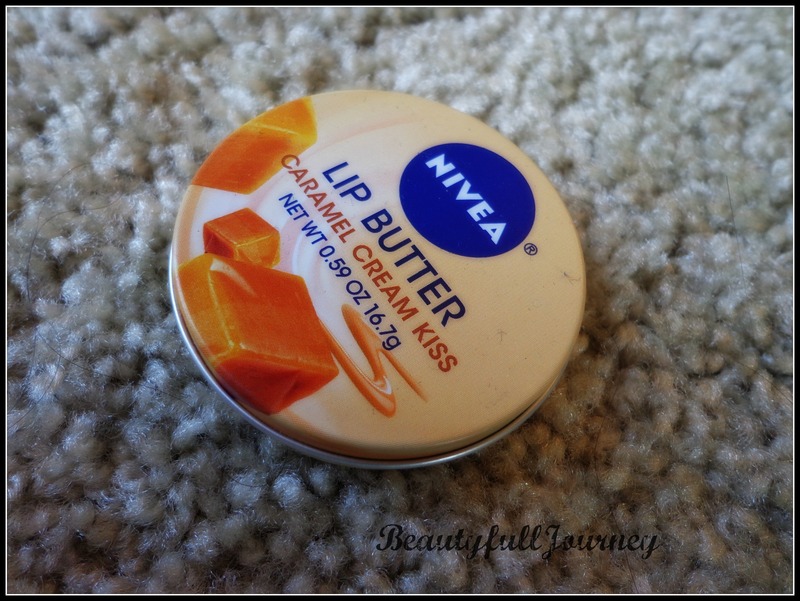 Nivea Lip Butter Caramel Cream Kiss Review, Pictures. I remember reading Radhika’s review on this lip butter some time back and I was literally craving to try this 😛 and when I came to US, this was one of the first few things I bought 😛 and it turned out to be so much more awesome than I ever imagined it to be. So, I decided this had to be the first product I review out of my new stash and also, because it has just been launched in India, so you all don’t need to envy me for getting it. And I’ll give you a full detailed review so you can make up your mind whether to buy it or not! Also, the tin reminds me of the blue Nivea cream. The tin would slip easily into your jeans pocket or any purse or wallet even. 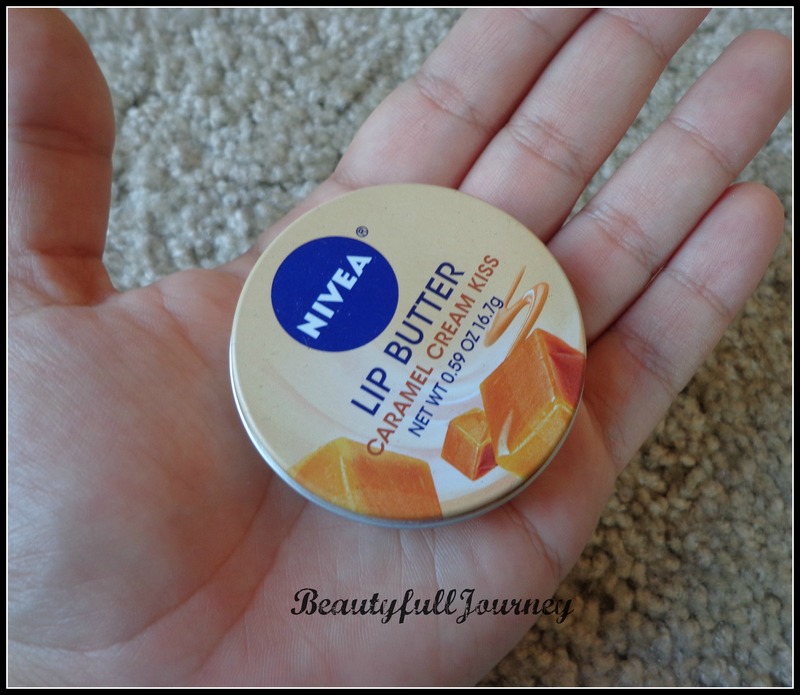 To me, Nivea has always been associated with good nourishing creams and this lip butter doesn’t disappoint on that aspect at all. The texture of the lip butter is very light. It doesn’t get hard in the tin, atleast it hasn’t got hard yet, if it does in the harsh winters I’ll let you know. The texture is soft enough to get a dent if you press hard. 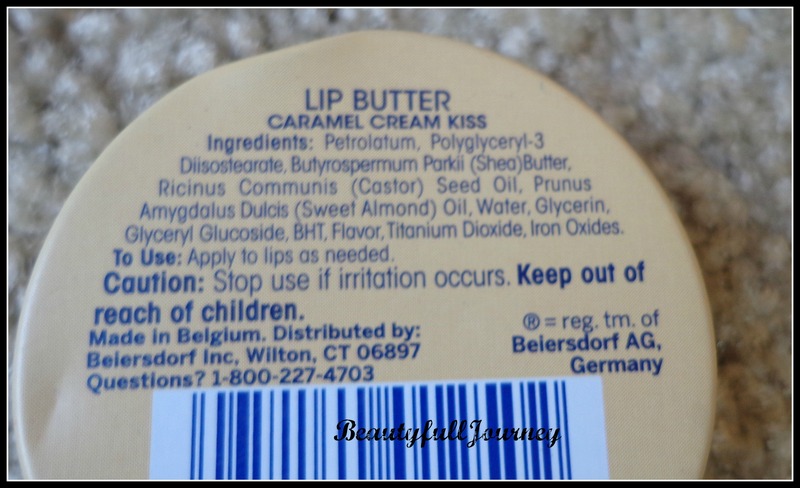 It goes on very smoothly on lips and spreads easily. It’s not at all greasy. I find that it moisturizes my lips very well. It truly makes them feel nourished and healthy! I’m guessing that with the soft texture, these MIGHT melt in very hot environments. I wouldn’t know because Chicago is generally never as hot as maybe Delhi. So girls be careful in summers with this! But then its just my guess. This lip balm comes in 4 flavours that I know of – one is plain lip balm with no flavor, then Caramel Cream Kiss, Raspberry Rose kiss and Vanilla and macadamia. I have the caramel one. I have also used the Raspberry one but it’s with my sister for now so no pictures of that, but that’s a great flavor too! Though I prefer the caramel more. 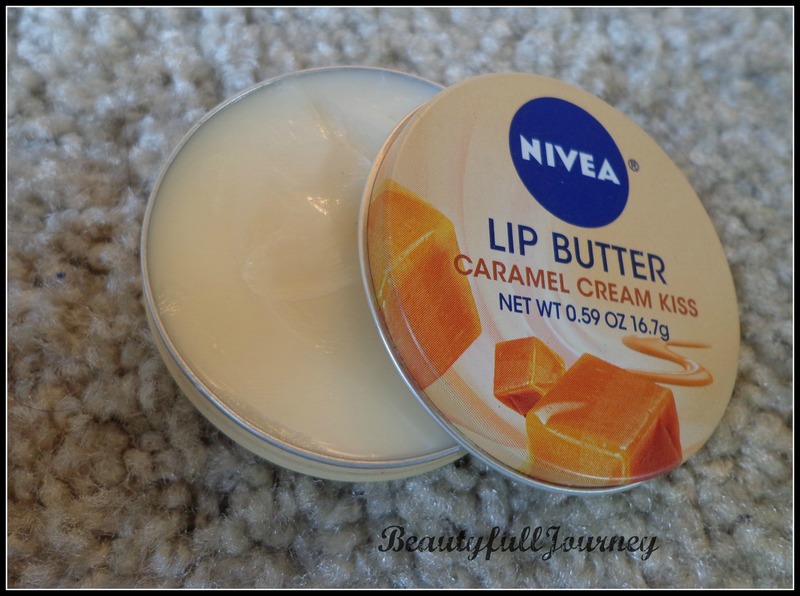 This one, Caramel Cream Kiss – is the most delicious lip balm I’ve used. It smells of a crisp caramel and vanilla flavoured cookie! It smells like fresh butter cookies. It even looks like butter in the tin, doesn’t it? Believe me, you need to smell it! It smells like a whole bakery! It seriously gives tough competition to (my beloved) The Body Shop fragrances. The product is really value for money according to me. It’s a huge amount of 16.7grams in this tin and the cost of Rs.189(India) and $2.78(USA) is very reasonable for this lip butter. This tin will last you forever!! If I ever finish this, I might try the vanilla one next! Price: $2.78 approx and Rs.189 in India. Available at all stores like Walmart, ULTA, Target etc in USA and in India purplle.com here. 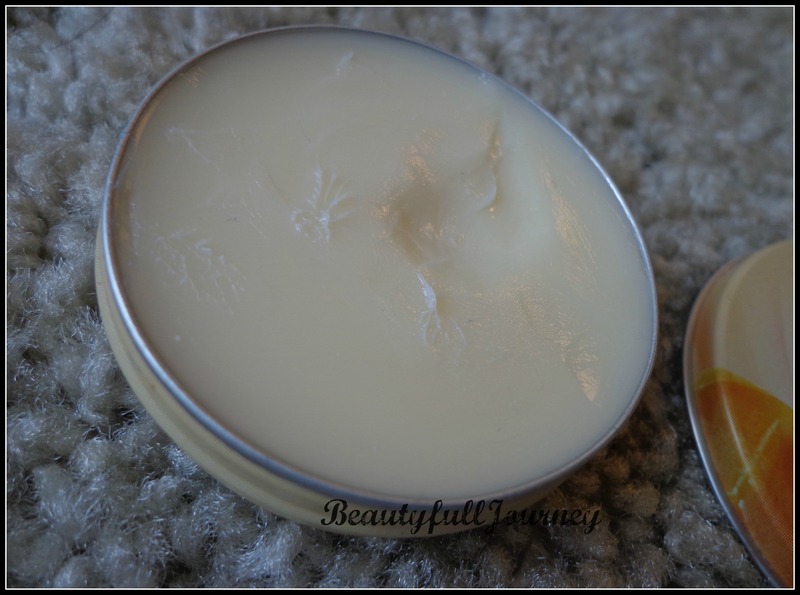 Overall, it’s a fantastic lip balm at an affordable price! It smells delicious and does its job of a lip balm very well! Highly recommended! 4) Very creamy and soft texture. 1) Availability – I’m not sure if it’s available everywhere in India yet. Next > REVIEW – Foodpanda.in online site.